Greedy goblin: How to build your own guild? How to build your own guild? I've read the "Build your own guild" series at World of Matticus, and you can find several such guides. You most probably would not expected it, but my GF and me tried to form a guild months ago. It's completely un-goblinish but it was an experiment we driven with effort and dedication, altrough the result was more or less sure before the beginning. 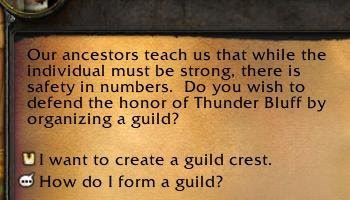 The short version of the answer: With some exceptions (detailed below) you cannot create a functioning raiding guild. To understand why not, you must first see that you cannot hope that anyone will be "loyal" to your guild. It's simple, everyone who came to your new guild is someone who left another guild (except for very new players). Why would be more loyal here than there? The problem is very simple: "the guild" cannot organize or do anything since it is not a body, it cannot act. You cannot touch or hit or talk to a guild. "The guild" is an abstract concept. The members are real. When "the guild" organize the raid, actually a raid leader does the organizing work, and other capable members attend, creating the enviroment to the new member where he can see boss kills if he pulls his weight. So it's you, the leader of your new guild who has to organize the raid. However since your guild is new you don't have other 8 capable members to create the enviroment where the 10th guy can join according to the terms listed above. You can collect 9 members since the trade chat is full of "LF guild" (and "LF guld" and "LF guild with freindly helpfull ppl") but most of them are not capable/want to to pull their weight. So if a capable member joins, despite his best efforts the boss will win and he will feel that while he did his part, the guild did not. So the capable members sooner or later leave for a functioning guild, leaving you with the rest. You can teach those who can be taught and kick those who cannot, if you have hours just for this every day. Still you will constantly lose those who are crucial to your progress since there will always be a guild that offers them more. After we have seen why can't you create a guild we must explain the obvious: guilds do exists. How can it happen? At the beginning, when the server was created there were no guilds. People formed guilds randomly and those which gained more good players progressed, and started attracting members. The other guilds disappeared. This original forming is no longer possible, except for new realms. There can be personal problems ("drama") among good players. This can make a functioning guild to break. While as a guild it's no longer functional, its members are still good players, so fragments of this guild can be seeds of new guilds. If 4-5 good players stick together under a new tabard, it is possible to create an enviroment where others would stay. So it's actually not a new guild, it's the old one after name change and some gkicks. Sprouting: functional guilds can outgrow themselves. If there are 35-40 active members, than 10-15 can't get into the raid. These people can decide to leave their mother-guild and form a "new" one. However it's not new, it holds the laws and customs of the old one, it's actually multiplying. A "friendly, social" guild, where no actual performance is required and expected can still contain good (or at least acceptable) players. They sooner or later find each other within the guild, instance together, than will want to raid. They can also be a core of a raiding guild. They may get control of the current guild, starting to recruit raiding members (and naturally pushing the social members into "second class citizenship"). They may have to leave their current guild to form their own. A "famous" person can attract enough people to form a guild. No doubt that if an ex-Nihilum member would start to spam trade that he now forms a raiding guild, dozens would apply. He merely have to filter the applicants, forming his core. A group of real life friends can easily form a guild. If they are good players (or can teach each other first), they can serve as a core for a new raiding guild. According to the last point Matticus has a chance to actually form a guild, but you don't. Don't bother trying. Before you would think I'm a pessimist, I'm not. I just say you cannot form a guild, I never said you cannot find one. If you are a capable player, all you have to do is look around your server and find a guild that do the raids you want. Ask them what requirements they have, fulfill them and here you go. Good luck! While true forming a guild is infinitely more difficult than joining one or forming one with the seeds from another guild, it is possible. Several RL friends and I formed a successful Kara guild from scratch (most had never raided, were new like me at the time, or came from a non-raiding guild). We lasted several months until guild drama broke it up and then my RL buddies and I did the guild float until all ending up together in another successful raiding guild. NOT impossible, just highly improbable. I wouldn't advise it unless you have a strong core of RL friends. Spamming trade or even (much better for finding competent guildies, but not for forming a guild from scratch) posting in recruitment forums just won't work for anything but a social guild. Our guild was formed thru LFM channel =) and look how we are doing now. I think it's mainly because we had a "famous" GM/CoGM that attracted players to transfer servers/or get back to our server and alliance to reroll horde.